Coyote (Brush Wolf, Prarie Wolf, Canis latrans). Source for Information, Sounds and Pictures of this amazing predator with links to all kinds of Coyote Web Sites.. 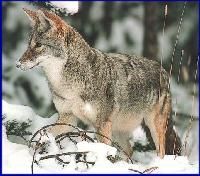 This site's objective is to provide an easy way for you to find information on North America's famous predator the Coyote. So many companies and groups use "COYOTE" as a name that it is hard to weed through all the web sites to find good information on the animal itself. The LINKS will take web sites which contain pictures, information, fiction and sounds. Need help with a school report on coyotes, or want quick basic facts. Try the facts page. Copyright 1999 Tim Jones. All Rights Reserved.